Considered the most sophisticated prehistoric native civilization north of Mexico, Cahokia Mounds once covered 4,000 acres, included around120 mounds, and at its peak had 20,000 inhabitants. The State of Illinois now protects 2,200 acres in the central part of the site. To get the most of a visit, make your first stop the Interpretive Center, where you can check out an audio tour, see an orientation movie, view galleries, get maps, and find additional information. You can then take self-guided or guided tours of the mounds—there are 81 in all—including the 100-foot high Monks Mound, the largest earthwork in North America. Interpretive Center hours: Wednesday – Sunday, 9:00 a.m. – 5:00 p.m. Gift Shop hours: 9:00 a.m. – 4:45 p.m.
Just 35 minutes southeast of Collinsville, Timmermann House Bed & Breakfast has a pretty country setting and rooms that pamper guests with Turkish towels, plush robes, Comphy sheets and delicious homemade breakfasts. If you visit in the summer, you can also enjoy the B&B’s award-winning gardens. Timmermann House B&B is a member of the Illinois Bed and Breakfast Association … a unique lodging experience! 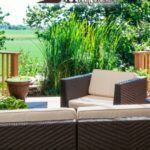 This entry was posted in Historic Sites, Illinois Bed and Breakfasts, Outdoor activities, Touring Illinois and tagged History, outdoor activities by admin. Bookmark the permalink.